But the result of the search is only on the previously opened file. Here I open only main.php. Do you know a way to search on all files without having to open them one by one ? 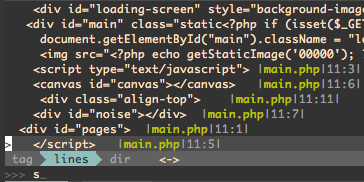 :CtrlPLine is actually supposed to work on listed buffers. but that doesn't sound like a very good idea for performance reasons. You lose the "fuzziness" of CtrlP, obviously, but you get reliability and flexibility in return. fzf allow to search on the listed files which include your string. Not the answer you're looking for? Browse other questions tagged search plugin-ctrlp or ask your own question. Possible to use CtrlP to interactively search file contents? How to store all occurrences of a multiline search in a register? How to execute command on every matching pattern, not just lines? How to redirect search results into a new file?